EA Sports owns the virtual pitch once again in ‘FIFA 14,’ a marginal current gen upgrade that excels for remembering to stick to the fundamentals. The best field game in any big sports video game. 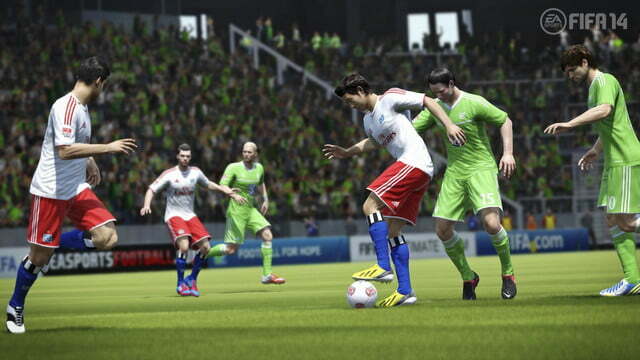 Streamlined user interface fixes FIFA 13's biggest problem. Great visual and audio presentation all around. Micro-transaction ecosystem is still pretty sinister. Terrible licensed soundtrack grates the ears when not playing a match. Still no women's soccer. Get it together, EA. FIFA 14 is not about soccer. Not at its foundation, not in the game’s heart of hearts. Soccer is its uniform, its trade. Playing FIFA is nothing like playing soccer, but it’s also nothing like watching professional soccer matches, experiencing the life of a star player, or managing a team. Those are all activities in EA Canada’s game, but none of them are simulations. The soccer player doesn’t control all of his teammates on the field after he passes the ball. The manager doesn’t play the game for the players he advises. The fan doesn’t march onto the field himself to support his favorite club. 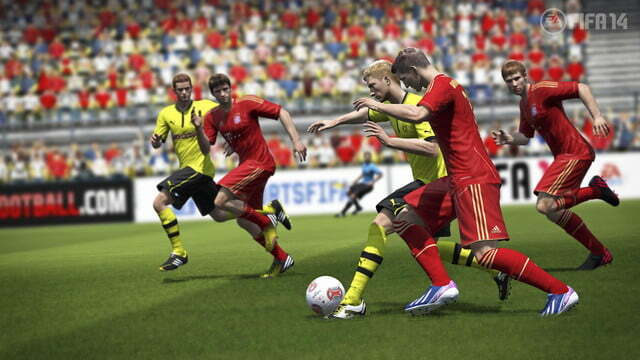 Playing FIFA 14 in these rules sees you crossing the boundaries of reality all the time. So what is FIFA if it isn’t soccer? It’s a video game. FIFA 14 is one of the most brilliantly tactile, immediately fun, and profoundly challenging to master video games out there right now. It’s a great way for fútbol fans to engage with the world’s favorite sport second, and a brilliant interactive digital amusement first. That’s FIFA’s greatest success, and it’s why FIFA 13 sold 14.5 million copies during its first eight months on sale last year. FIFA 14 replicates that success and brings a number of welcome improvements to the package while leaving the field game identical. The silken feel of controlling players in FIFA will be instantly familiar for series fans and instantly inviting to any neophytes picking up the game for the first time. EA Canada confirmed that the current gen version of the game wouldn’t benefit from the new Ignite Engine used in the PlayStation 4 and Xbox One version due in November, but it would introduce Precision Movement. 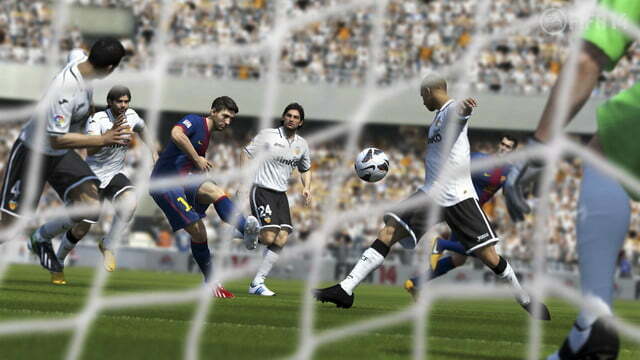 A series of physics and animation tweaks to the game was touted as a way to make the field game look and feel more like real soccer. In practice, it’s not very noticeable. FIFA 14 is tactilely identical to FIFA 13. FIFA 14 is one of the most brilliantly tactile, immediately fun, and profoundly challenging to master video games out there right now. That’s a good thing! The EA Sports business, in its drive to add new features to entire players to buy yet another annual release, tends to tweak too much trying to fix parts of the game that aren’t broken. EA Canada wisely leaves the field game intact. Dribbling the ball as runaway striker, dodging between defenders, still has the same succulent momentum. Passing between players and shooting still feels intuitive but subtle, requiring serious practice to perfect even on lower difficulty settings like Semi-Pro. Scoring that first goal is still a pure gaming pleasure. Even when using a custom player in the game’s Career Mode, when you’re still a scrub and a far cry from the precision skills of stars like Lionel Messi, the game feels great. The impressively smart artificial intelligence driving players not under your direct control goes a long way toward giving FIFA 14 that signature feel. The game is built to always make you feel engaged in each match’s primary action, seamlessly placing you in control of a defender nearest the ball carrier. It’s also great at interpreting your intent, though. It’s never frustrating that you don’t have broader direct control over non-ball carrying teammates because the game is so smart at reading what you’re trying to do. It won’t play the game for you. If you don’t block that shot, your goalie won’t make the save on his own. But the game does read your intent well while also facilitating your control of each team member. 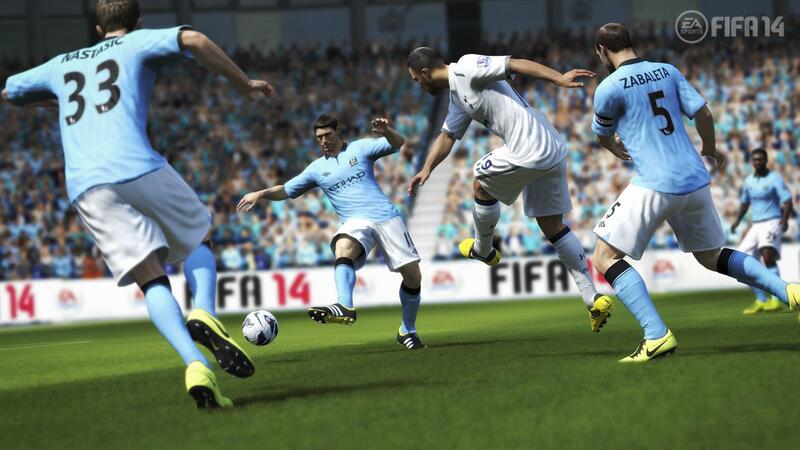 The natural, smooth feel of the field game is the heart of FIFA 14’s second greatest success: Skill Games. Not to give EA Sports any ideas, but this tutorial mode could be sold as a $5 downloadable game on its own. Ranked drills teaching you basic skills are addictive and fun, like learning cross-field passing by hitting targets. Little interface design touches help make these so pleasurable. There’s no loading when you fail at a penalty kick test and restart it. 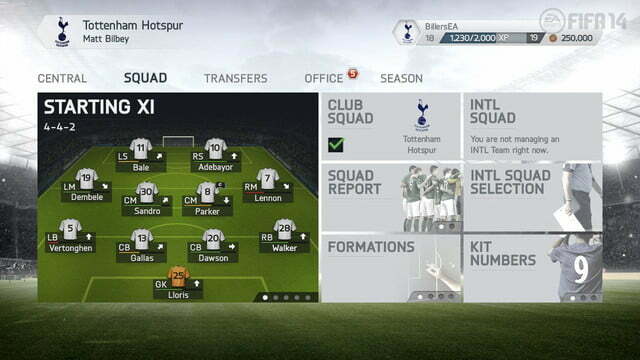 FIFA 14‘s interface is built to never stand in your way. 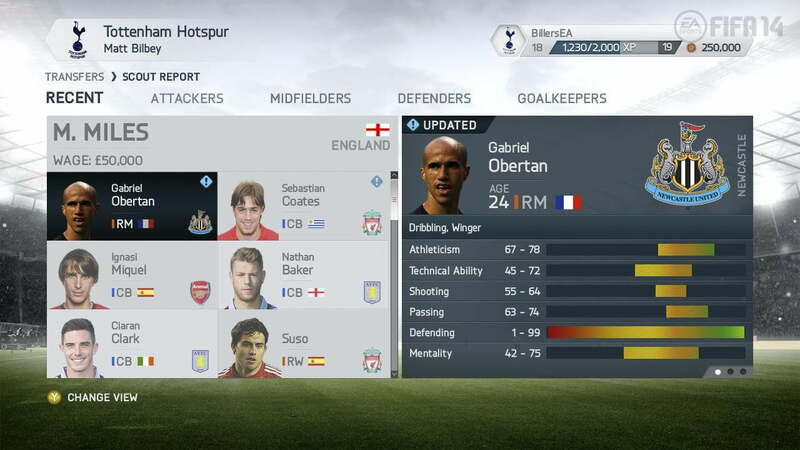 In fact, the interface changes mark the most significant and welcome improvements in FIFA 14. Compared to FIFA 13, this is a far more usable and inviting game. 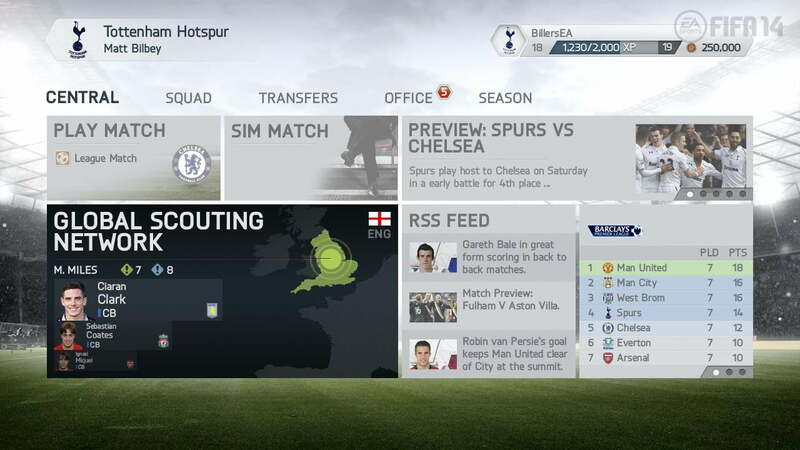 The management career mode for example, is much easier to access, learn, and play in FIFA 14 thanks to its marquee placement in the top menu. The big play change to management mode in this year’s game is the ability to hire scouts to go out and look for prospective players. You can pick precisely what type of player you’re looking for based on a range of attributes, from what position they play to their general attitude, and then send your scout to various regions around the world to find them. Depending on the scout’s rating–better scouts cost more of your annual budget–you’ll have a small sampling of players to further scout and hopefully recruit to your team. 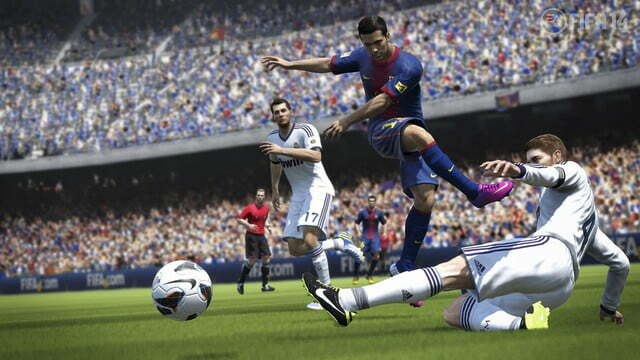 The natural, smooth feel of the field game is the heart of FIFA 14’s second greatest success: Skill Games. While this seems like a significant change to management, it’s ultimately a clever way of streamlining the game’s interface. Rather than looking at a massive list of players and trying to pick who you want to try and add to your roster manually, the scouts help to filter your search and make it relevant to the simulation game. That makes it easier for you to get to the actual matches your team will play, which ensures that you’re getting out onto the pitch that much quicker. Even Ultimate Team, the trading card cash cow at the heart of EA Sports’ franchises, benefits from a simpler interface. Managing your deck of cards/players and arranging them on your squad to maximize their chemistry is easy thanks to clear, uncluttered screens. All your available cards are on the bottom of the screen, and color-coded lines link your players on the squad. Good chemistry – determined by factors like each player’s preferred position, nationality, and real world team lineup – is marked by green lines while red lines mark bad chemistry. It’s simple and intuitive. It also helps that EA has pushed micro-transactions into the background. You can still pay real cash for better players in Ultimate Team, and EA still uses some dirty tricks to try and get you to spend. A Gold pack of cards, which yields better players, costs 150 FIFA bucks, or $1.50, but EA only lets you buy said bucks in $1 or $2.50 packages at the lowest. The noisome price gouging is left in the background though, after being constantly pushed to the forefront in FIFA 13. Football Club – everything you do in FIFA 14 levels up your Football Club rank, a basic player profile that covers the whole game – even tones down the “Buy it all!” presentation that marred FIFA 13. 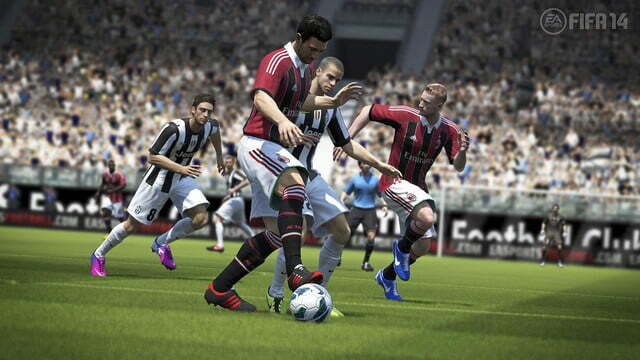 Just one more way that FIFA 14 emphasizes clean presentation rather than needless play tweaks. FIFA 14 gets you to the field as swiftly as possible at all times, and that makes it arguably the best sports video game out there. It recognizes that playing these little digital competitions is why people are buying the game in the first place. Its video gameness is paramount. That’s not to say it doesn’t do soccer very well. Even on an old machine like the Xbox 360, FIFA is gorgeous to look at and hear… or the sound effects and commentators, at least. This year’s licensed soundtrack is a mire of limp pop trash. Just an awful selection of songs. At least there’s not a preponderance of dubstep. That said, if you stripped away the myriad licensed teams from around the world, the painstakingly recreated stadiums, the hours of recorded commentary and actual field noise, and replaced them with stick figures bouncing around a dot on a black screen, FIFA 14 would still be insane fun. Love soccer? Play FIFA 14. Don’t care about soccer but still love video games? Play FIFA 14. This game was reviewed on a PlayStation 3 using a copy provided by EA Sports. 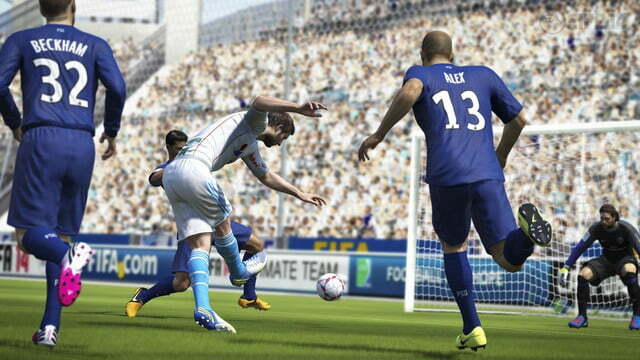 Streamlined user interface fixes FIFA 13’s biggest problem. Still no women’s soccer. Get it together, EA.